please close all in the money options before 3.29 to save STT . Close all May Future contracts . rollover to June if u desire to do so . Gap down opening is expected . yesterday's intraday chart is showing that after a gap down start bulls tried to hold nifty and started to up lift it but selling pressure from higher level strengthen the bears and in last hour they sent nifty below opening range. confirmed that bears are still dominating .Asian and international markets are weak. Indian markets are totally depend on option players and as per option data we are seeing huge puts build up 4900 and call build up above 5000...it is indicating expiry at 4900+/- 40 points . so do not trade in panic spot the trend and play accordingly. we will see wild moves today so trade only if u are fast and use stop loss orders to limit losses. Gap down opening is expected with mixed bias and extremely volatile session ahead ..
buy on dips till nifty is trading above 4945 ..
current nifty range is 4945 - 5070 ..
below 4945 it will trade in 4785 >< 4945 its old range ,so 4945 is crucial for both -bulls and bears ..
keep strict stop loss of 4924 ..
trade with strict sl placed in system. Never trade without stop loss on my calls ..
U.S. stocks advanced more than 1% Tuesday amid positive headlines out of Greece and China, even as the euro fell on worries about a deepening debt crisis across the pond. Flagship explorer Oil and Natural Gas Corporation's net profit more than doubled to Rs 5,644 crore in the quarter ended March on the back of high crude price and the fall in rupee offsetting a steep rise in fuel subsidy outgo. Net profit for the full 2011-12 fiscal rose 33% to Rs 25,123 crore. traded below 87 and above 110 .. IT major infy L&T are ready to blast up... metals may also join the rally with fin stocks . trade with strict stoploss placed in system. two white soldiers after a spindle bottom are inviting u to go long because we may see third one today ..
Buy RCOM in cash/futures at or above 66 for positional targets of 72 -79 -85 -91 -96 in less than 90 days period .stop loss 60 closing basis . 1. Market is characterized by downtrend. 2. We see three consecutive long white candlesticks. 3. Each candlestick closes at a new high. 4. The opening of each candlestick is within the body of the previous day. 5. Each consecutive day closes near or at its highs. The Bullish Three White Soldiers Pattern appears in a context where the market stayed at a low price for too long. The market is still falling down and it is now approaching a bottom or already at bottom. Then we see a decisive attempt upward shown by the long white candlestick. Rally continues in the next two days characterized by higher closes. Bears are now forced to cover short positions. The opening prices of the second and third days can be anywhere within the previous day's body. However, it is better to see the opening prices above the middle of the previous day's body. If the white candlesticks are very extended, one should be cautious about an overbought market. The reliability of this pattern is very high, but still a confirmation in the form of a white candlestick with a higher close or a gap-up is suggested. Nifty view for settlement week ...nifty may trade between 4784 to 4945 . on success-ful close above 4945 we will see 5075 >>><<<5205 on spot ...we are expecting that nifty will trade at 5350 5400 5600 level in next six month ..
what are they accumulating ??? Sell and buy axis bank - what u will do ? 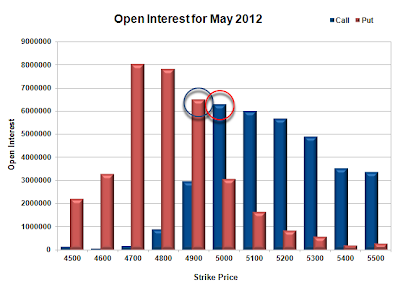 kailash123p (5/24/2012 8:07:08 PM): who is holding ng or booked gains ? Trade in Nifty futures as per these levels .. Alarming fact is net buying in index options of 800 Cr....calls or Puts ??? Natural gas 148.80 to 146.10..
Nifty pre market out look-all targets achieved ..
long unwinding seen in nifty 9 point fall ..